Complete Spare Parts in Stocks! 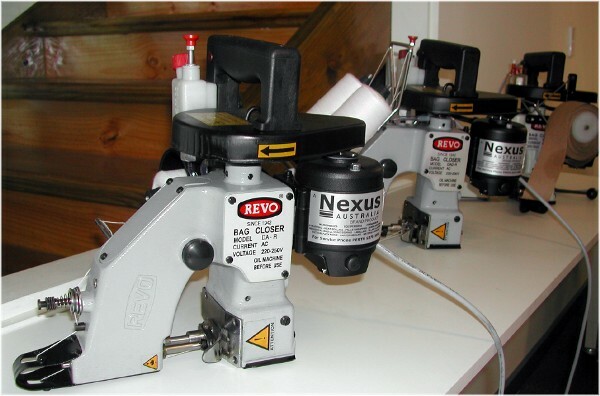 Revo® DA is a single-thread chain-stitch portable filled bags closing sewing machine. This robust machine stands up to the most demanding sewing jobs on all types of paper, textile and poly bags made from HDPE/PP, etc. It is simple to operate, even for inexperienced users. The reinforced feed mechanism consisting of wider presser foot and feed dog with a bigger throat plate than conventional single thread chain-stitch bag closing machines helps achieve smoother, even and better looking plain and folded top closures. Revo® bag closing machine housing is cast and machined to close tolerance and the parts undergo suitable heat treatment processes making them wear resistant, thus reducing downtime and repair costs. This machine is dependable even under the most adverse operating conditions in an agricultural or industrial environment. Trouble-free continuous operation:Closes bags at ease on the bagging line or in the field. Quiet operation:High-grade, wear-resistant nylon cam ensures minimum noise level in comparison to loud noise experienced in machines with steel cams during operation. Safety handle:Strong plastic handle for insulation. Non-corrosive finish:Essential as it helps resist corrosion in damp and humid conditions. Superior powerful lubricator:Lubrication system consists of an oil pump and a reservoir. Oil lines from the pump direct the lubricant to the main moving parts. Sealed Motor:Ideal as it provides the motor with a total dust-proof enclosure. Automatic thread cutter:Protected cutting blades sever the thread after the bag is closed. Timing Belt:15mm toothed belt helps the machine operate without much effort under tense workload. Adaptable:Stationary or suspended use can be attained from this machine without loss of useful portable features. Suitable for outdoor use:bag closing machines also available with a 12V DC motor for operating on standard motor vehicle battery. Presser foot lifter and thread cone cover:Standard in all bag closing models. Optional accessories:Conveyor stands, shoulder belts, spring balancers with hangers are available at extra cost. 8oz. Cotton or Synthetic thread cones. Revo® portable bag closing machines are suitable for closing all kinds of small to large bags used for chemicals, fertilizers, animal-feed, food grains, food products etc. Revo® has been manufacturing bag closing machines since 1950 and because of our belief in quality, durability and performance, more than 500,000 bag closing units have been sold worldwide.